Description: Terrestrial herbs, sympodial; roots subterranean, filamentous; tuberoids paired. 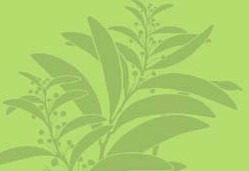 Leaves well-developed and green or rarely reduced and reddish, basal, 1 per shoot, cylindrical, hollow, not petiolate. Inflorescence racemose or spicate, many-flowered, terminal, emerging through a slit near the tip of the leaf. Flowers not resupinate. Dorsal sepal free, often cucullate, shorter than, and usually slightly broader than lateral sepals. Lateral sepals free but often basally coherent. Lateral petals free, shorter and narrower than dorsal sepal. 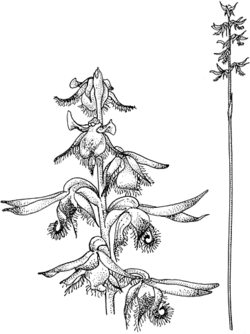 Labellum free, attached to the column foot by a short, flexible claw so that it is mobile; lamina not lobed, with entire or finely toothed margins, with a single, 1- or 2-lobed callus extending from the base and often covering most of the lamina. Column lacking free filament and style, stubby; column wings fused basally to column but apically forming prominent, free, lateral, entire to 2-lobed arms. Column foot shorter than the column. Anther erect, usually slightly decurved, persistent. Pollinia 4, in 2 caudicle-bearing pairs, granular. Stigma entire. Rostellum ventral. Ovary usually decurved. Distribution and occurrence: World: c. 40 species, Australia, New Zealand, New Caledonia. Australia: 39 species(37 species endemic), all States except N.T.